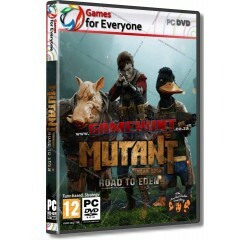 Mutant Year Zero - Road To Eden - R130,00 : Game Hunt, Where we lead, others follow. From a team including former designers of HITMAN and PAYDAY comes Mutant Year Zero: Road to Eden, a tactical adventure game that combines the turn-based combat of XCOM with real-time stealth and exploration of a post-human world reclaimed by natureâ€¦ and Mutants. TACTICAL COMBAT - Mutant Year Zero: Road to Eden is the ultimate fix for your tactical strategy addiction. Dive into a deep, turn-based, tactical combat system inspired by the XCOM games. EXPLORE A POST-HUMAN EARTH - Journey through a post-human world of abandoned cities, crumbling highways, and overgrown countryside. Check back at the Ark, a neon-bathed oasis of ill repute and questionable characters, to restock your supplies and plan out your next adventure. CONTROL A TEAM OF MUTANTS - A duck with an attitude problem and a boar with anger issues; these aren't your typical heroes. Get to know Dux, Bormin, Selma, and many other characters each with their own unique personality and deranged perspective on the world and their situation. MASTER THE STEALTHY APPROACH - Sneak through shadows to avoid conflict or to catch enemies unaware. Real-time stealth allows you full control of approach: sneak into an enemy camp, position the team of Mutants to your advantage, and gain the element of surprise. UNLOCK MUTATIONS - Unlock new mutations and abilities for your Mutants, such as Selma's grasping vines, Bormin's Charge, and Dux' uncanny ability to sneak into a camp full of enemies unnoticed, despite being a 4-foot tall walking, talking duck with a crossbow. DYNAMIC ENVIRONMENT - Use the environment to your advantage. Stay out of floodlights, hide from line of sight, or just blast down fully destructible walls and buildings and wreak utter havoc. LOOT, LOOT EVERYWHERE - From makeshift slingshots to high-powered rifles and top hats to police vests, make sure you equip your Mutants for the dangers ahead. Nothing says post-human quite like a mutated boar in spiked metal armor charging at you with a blunderbuss in his hands. Processor - Intel Core i5-760 or AMD Phenom II X4 965® or equivalent AMD® processor.